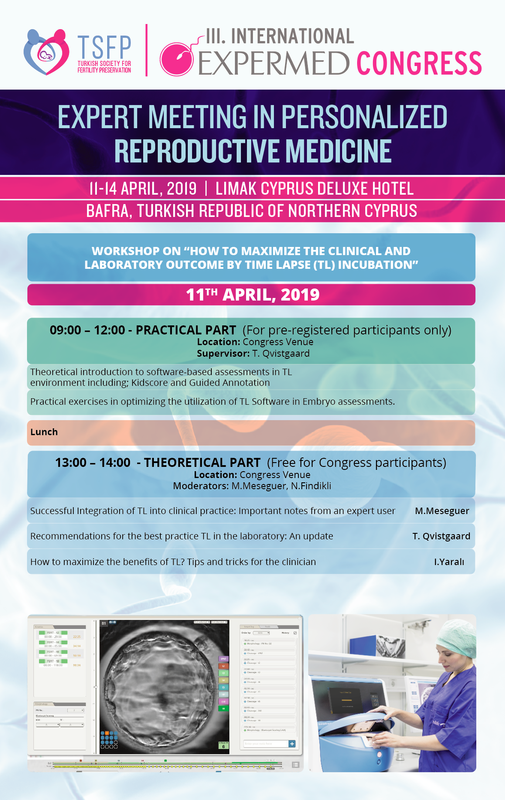 It is a great pleasure for us to invite you to join us in the “3rd International EXPERMED Congress” which will be held in Cyprus between April 11th – 14th, 2019. 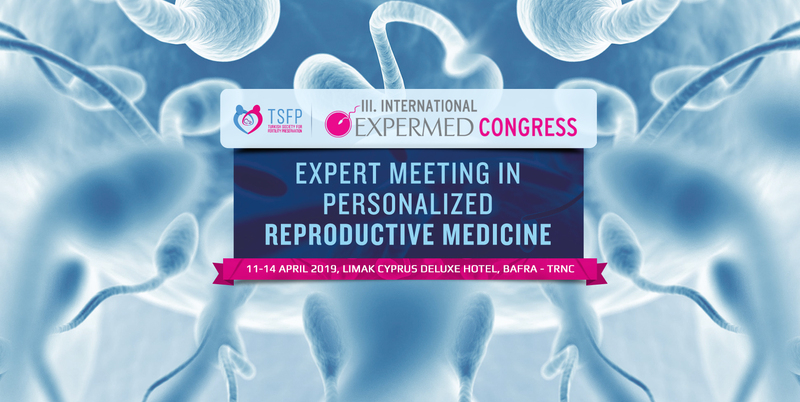 As the world of reproductive medicine has been evolving very rapidly, EXPERMED Congress Series aim to gather key opinion leaders and experts in the field of human reproduction and assisted reproductive technologies in order to discuss the current knowledge, practice and emerging technologies which are now shaping the future of personalized reproductive medicine. 2nd International EXPERMED Congress, which was held in Cyprus between April 27th-30th, 2017, was a huge success. 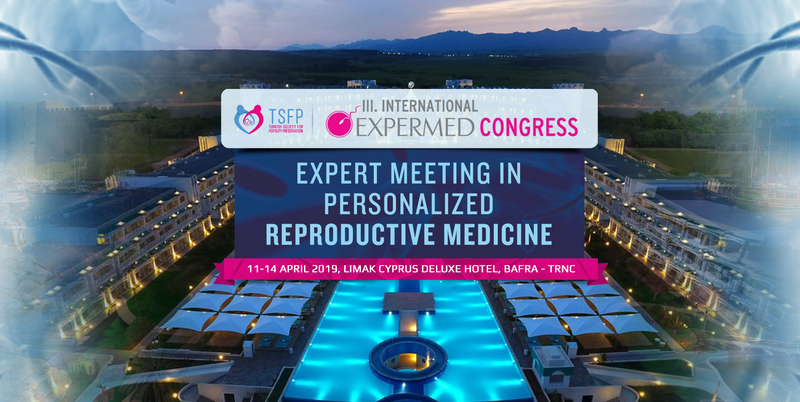 With more than 30 renowned international speakers as well as over 500 participants, the meeting has already created a great interest in the region and fulfilled its goals by creating a unique environment and network to discuss and evaluate possible contributions of novel clinical, laboratory and omics-based technologies on today’s personalized reproductive medicine. 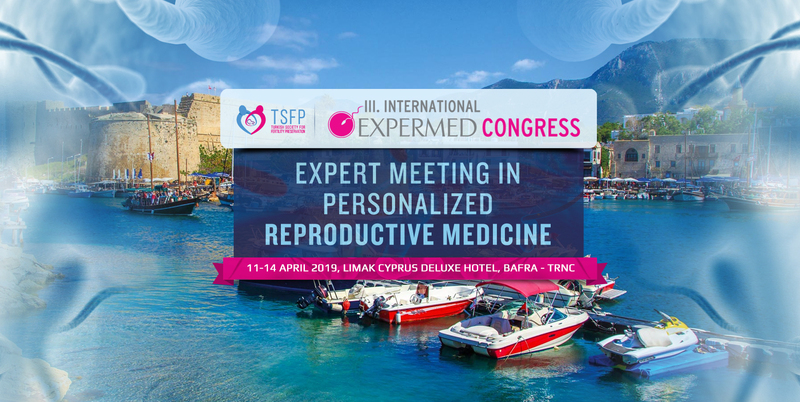 In the 3rd International EXPERMED Congress, the focus will be the impact of these novel approaches & technologies on the diagnosis, treatment and management of difficult infertility cases through real life examples & cases, keynote lectures, and debate sessions. 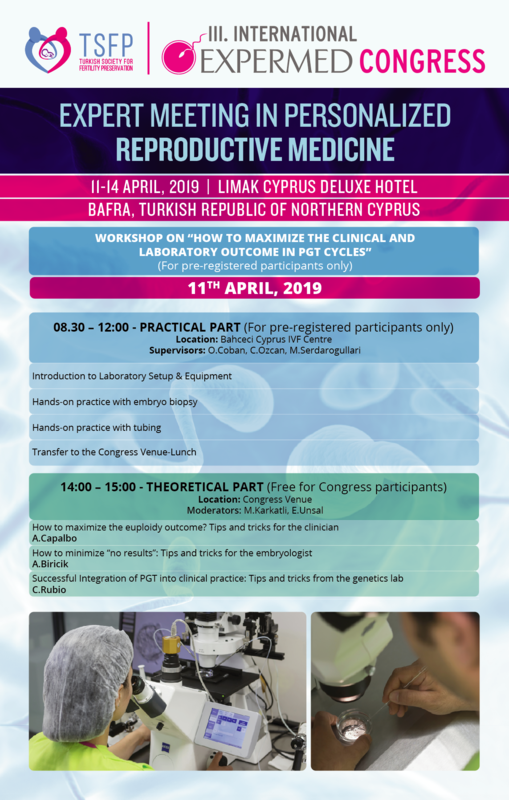 The congress will be held in Bafra region of Cyprus. April in Cyprus Island is also a wonderful time to indulge yourself with the sun, the sea and the distinguished social services provided by the congress venue. For colleagues interested in more than sand and sun, Cyprus also has plenty of archaeological sites, fine Byzantine churches, monasteries and museums. It's also a wonderful place to go hiking, with an incredible wealth of natural beauties. A more detailed information on the congress venue, scientific and social programs can be found in the congress website (www.expermedcongress.com). F. Kubra Boynukalın, M.D., M.Sc. Personalized Reproductive Treatment & Care: Where are we now and what does the future hold? Contemporary endocrinology vs. Genetics: Will the latter replace the former? State of the Art of PGS: how, when, and to whom? State of ART infertility treatment: Should it be disease vs. patient-specific? Improving standards in the IVF Laboratory: How far can we reach? Freeze-all strategy: Should all embryos go into the fridge in the near future? Effect of lifestyle and environment on sperm quality: Any scope for an improvement? Novel Use of Genetic testing in early diagnosis in Endometriosis: fact or fiction? Embryo Mosaicism: What to do? Gamete and embryo cryopreservation: What is the best strategy? Ovarian tissue transplantation: How far will it stay experimental? Ovarian tissue preservation: Ready for worldwide use? Admission to all scientific sessions and activities. Entry to all scientific and commercial exhibition areas. Documents; Bag, programme and abstract book, name badge, certificate of attendance. Accomodation fees including all inclusive for 3 nights. The price of group transfers, which will be arranged on the arrival and departure dates of the Congress is 40 Euro per person per way. Please contact Figur International directly for any transfer requests you may have. Cyprus being the third largest island in the Mediterranean has risen strategic, political, commercial and religious interests all through history. This charm of Northern Cyprus has provided its visitors with incomparable mystic, spiritual, comfortable and peaceful vacation. Northern Cyprus is the intersection point of Europe, Middle East, Asia and Africa. The closest neighbors are; Turkey, Southern Cyrus, Lebanon, Greece, Egypt, Israel and Syria. With its unique beach, plains and mountains, Northern Cyprus has 396 km of coast. In addition, its history and geographic location has given it a surprising synthesis of eastern and western cultures. Civilizations which date all the way back to 11 thousand years, rich multicultural heritages and relics are dispersed all around the island, which gives it an unique beauty. Northern Cyprus’s official language is Turkish. English is also being used commonly. Ercan Airport is located 12 km at the east of Northern Cyprus’s capital Lefkoşa. International phone code is + 90 392. Internet can be accessed through all cities, villages, hotels and cyber coffees.In addition you may use your mobile phone all through the island. The roads are just like in England from the left hand side. Seat belt use is mandatory. All signs and road structures are in correlation with international standards. Turkish Lira is being used in Cyprus.You may change your currency from the hotels, banks and exchange bureaus. Majority of the credit cards can also be used. In TRNC the electrical voltage is 240 and the BS standard is used. 220/240 Volts A / C with 3 adapter is used. Between May and October the average sea temperature is 24 C and you may access restaurants, cafeterias and bars alond with umbrellas in case of need. In addition activities like waterslide, banana, jet-ski, parasailing etc. are available. The most popular gifts which are purchased are; copper, silver, bronz and wodden goods, Turkish dolls, Meerschaum pipels, backgammon games, gold jewelery, leather jackets and textiles can be bought at cheap prices. Prices are stable and there is no barter exchange in Northern Cyprus. Shops are open between 8.00-13.00 and 15.30-20.00. At Sundays they are only open in the mornings. Handcrafts outside the pottery are not intended for tourists. It is against the law to remove antiques from the country. 1. The abstract must contain original work, not published, submitted for presentation at a meeting of another national or international scientific organization, or submitted for publication at the time of this submission. 2. Abstracts must be approved or exempted by the appropriate Institutional Review Board (IRB) with jurisdiction or equivalent if any human subjects or any human materials were utilized. 3. A disclosure of medically related commercial and financial relationships for all authors is required. 6. Notification of acceptance and rejection will be emailed to the lead authors on a rolling basis. 7. Accepted abstracts will be published in the conference’s abstract book. 8. Withdrawal of abstracts can only be accepted if notified in writing and subsequently confirmed by the conference secretariat. It is only possible to withdraw an abstract until 14 days after notification on acceptance. 9. The presenting author must be registered as an active participant. Congress Secretariat reserves the right to exclude any abstract that is not followed by a participant registration. 10. Support: Identify all sources of financial support for the research or state “None” if appropriate. 11. Abbreviations used in abstracts must be defined when they first appear. 12. ACCME guidelines require generic names be used for pharmaceuticals, biologics, and medical devices. The trade name of the particular product used in a study may be included in parentheses the first time the product is referenced. 13. Presenting author must be listed first. 14. Please note that the body of the abstract cannot exceed 500 words.